Hi all here is my first small crocheted piece for this crochet along. 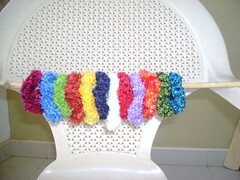 I made these scrunchies using Indian yarn called Vardhaman Feather yarn. someone’s hair will look mighty cute wearing those!